This is the first time since the 1970s that America has claimed the top spot, the U.S. Energy Information Administration (EIA) reported this week, confirming months of predictions that U.S. production would top Russia’s after two decades of trailing behind. 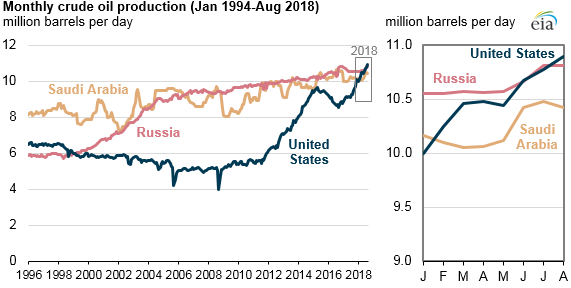 EIA expects U.S. crude oil production to continue to exceed that of Russia and Saudi Arabia for the rest of 2018 and through 2019. This scenario offers a stark contrast to 10 years ago, when the United States faced an oil price shock as we imported more than two-thirds of our oil. Americans were unsure how much and how fast U.S. production would decline – and the idea that our nation would ever again surpass the Russia and Saudi Arabia seem far-fetched. We can thank American innovation and technology advancements in hydraulic fracturing and horizontal drilling and analytics which over the past decade have revolutionized American energy production and proven to be some of the most successful technological accomplishments in our nation’s recent history. Innovative oil and natural gas production techniques –have closed America’s the gap and again become the world leader. That includes offshore oil exploration, which continues to elevate America’s global leadership and bolster our energy security. And with the Administration’s initial proposal to lift an Obama-era ban on drilling in most offshore waters, we have the potential for a major expansion in the future. Increasing oil output – primarily in the Permian region in western Texas and eastern New Mexico, the Anadarko Basin in Oklahoma, and the Bakken region in North Dakota and Montana – has reduced the need for foreign imports, as we can better meet our own domestic energy demand. These trends have paired with the critical overturning of the ban on exports, allowing us to become a key exporter – strengthening U.S. national security and helping to supply and empower allied nations. Increased energy production has also reduced electricity costs and coupled with an abundance of feedstock we have also increased our competitiveness in the manufacturing sector, creating more jobs and attracting more international investment. America clearly has the resources, and we also have the technology and the skilled workforce to produce them. Unsurprisingly, the U.S. Chamber’s Global Energy Institute’s 2018 International Index of Energy Security Risk confirms that increased oil and gas production has helped shift the center of energy power to the United States. The United States now ranks as the second-most energy secure nation in the world, climbing the ranks from No. 9 a decade ago. More than a decade into America’s energy revolution, it’s clear we are only beginning to see its potential. We are energy strong – and we will continue to grow stronger.